Things to do and see in Owhango and the surrounding district. Visit the Department of Conservation website for Tongariro Forest Park for more information. This is an easy walk for all the family through classic New Zealand native forest. Locally, we consider it the gem of the village – not to be missed. Time: 1 – 3 hr loop track, on both sides of the gravel access road. The walk can be broken into two sections or done as a whole, depending on fitness and time available. The track winds through magnificent and varied native forest and over the Ohinetonga Lagoon boardwalk. There are picnic areas and good places to swim along the river. For keen botanists, the forest contains mixed podocarp/broadleaf species and you may also see rare plants including orchids, ferns and fungi. The Reserve is home to many native birds including whio (blue duck) on the Whakapapa River and weweia (dabchick) on the lagoon. Location: If you are driving, your best option is to go down Ohinetonga Rd (also known as Whakapapa Bush Rd) to the parking area at the bridge. There are spectacular views of the Whakapapa River and Tongariro Forest from the bridge. If you walk from the village, about 5 minutes down Ohinetonga Road you will see a ‘person walking’ sign. Just past this sign is the top entrance to the loop track. For a shorter walk, take the right hand entrance to the track. It is 5 minutes to the lagoon and a further 10 minutes down to the river. Then it is a further 5 minutes downstream to the bridge and car park. You can then walk back up the road (about 20 minutes). Or you can add an extra 1 hour to the walk by continuing downstream along the track for about 10 minutes to the BBQ area by the river. Take the bend to the left and walk back up through the forest to the road and the walking sign where you started. The Whakapapa River is the largest tributary of the Whanganui River and is world renowned for trout fishing. Anglers come from all over the world to fish for trout. Don’t forget you will require a fishing license, available from the Information Centre or or Seriously Outdoors sports shop in Taumarunui. The fishing season on the Whakapapa is from 1st October to 30 June. Locals have a favorite swimming hole. Just before the bridge, follow the Ohinetonga loop track upstream (right hand side) about 700 metres where you will come to a fork in the track. On the left is the river access. There are 2 tennis courts located at the Owhango Domain. They are in a beautiful setting amongst the bush. You may have to give them a sweep before playing. Let Sarah Cate from Adventure Kayak Tours take you down the Whakapapa River. Owhango is at the end of the famous 42 Traverse, this is one of New Zealand’s best day rides, taking anywhere from 3 to 7 hours. You can be on the mountain in ½ an hour from Owhango if you choose the Whakapapa ski area or 1 hour if you choose Turoa ski area. Owhango makes an excellent base to venture in to the Tongariro Forest Park for a hunting expedition. Contact the locals for more information about the area and guided hunting trips that are available. The season runs from mid January to mid March, pick your own available, Owhango Road by the railway. 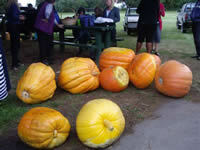 The Owhango Pumpkin Growing Competition is an annual event. The competiton is organised and run through the local Owhango School and there are always a large number of entries and the competition is strong. Owhango being a large farming community you can guess that the pumpkins are huge. The T42 is an annual event that takes place in May, and finishes in the domain at Owhango. The event includes a run and bike ride through the Tongariro Forest Park along the 42 Traverse. A local beekeepers club was formed in August 2012 and there are an increasing number of bee hives in the Owhango area. The club has a monthly club meeting in the Owhango Hall every second Tuesday in the month at 7:30pm and at least one field day each month, depending on the season. The club welcomes new members and has a website and an online membership form if you are interested in joining our club. We accept applications outside of Owhango and see this as a club based in Owhango but can cover the wider Ruapehu region..and lets face it, the bees dont really care.. The neighbouring village of Kakahi is the home to a very accessible glow worm grotto in the pumice cutting of the old tram way on Te Rena Road near the Whakapapa River. Meets every Tuesday (excluding school holidays) at the Domain pavilion from 9.00 am till 11.00. Every Sunday between October and March at the Owhango Hall. Contact Laurie Bryan, 078954870.